More than a few months ago I was in Illinois for a house-sitting job and to visit with family and friends. While there I had quite a few opportunities to see exactly what I could eat that was plant-based (vegan) while out socializing at local but suburban restaurants. I was surprised by my former home area and how many options that were available. These are simply meals I loved and places I wanted to share, I was not compensated for sharing. Enjoy! Welcome to El Taco Grande located in downtown Batavia, Illinois—a local favorite. Jeremy, Alma and I stopped here for lunch one day and I was convinced I would be able to find something on the menu and I did. To the best of my memory El Taco has been in Batavia for close to 20 years. It is family owned and operated by the Manuels. I remember in my middle school years, we would order their Fiesta Quesadilla every Friday or every payday Friday. It was a 2-layered tortilla pizza the size of a regular pizza and filled with cheese, ground beef, pickled jalapeño peppers, and lettuce. It came topped with more peppers and sour cream. We all loved digging into the somewhat greasy crispy goodness. It’s been many years since I’ve had that particular menu item as my tastes expanded to know items like enchiladas, stuffed peppers, burritos, tostadas and more. 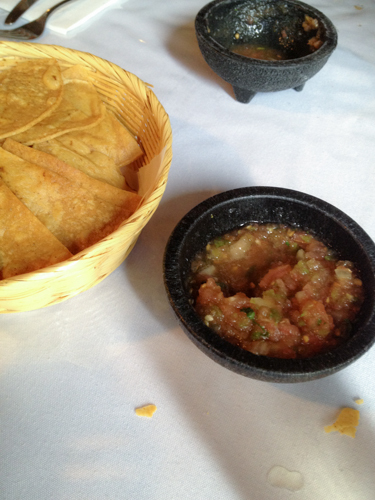 One thing everyone looks forward to devouring is their homemade chips and salsa. I believe they are made fresh everyday, very early in the morning. They are so good in fact that after the complimentary basket when you arrive, they charge you a small sum for each basket. Worth it. I used to love their guacamole too but sometime (maybe 15 years ago) they started adding sour cream or mayo to extend the avocado or the life of the avocado. Either way it’s not my thing, even before I was vegan. Guacamole is so perfect as is, you know? Living in Portland at the time of our visit, it had been a few years since I’d been there. 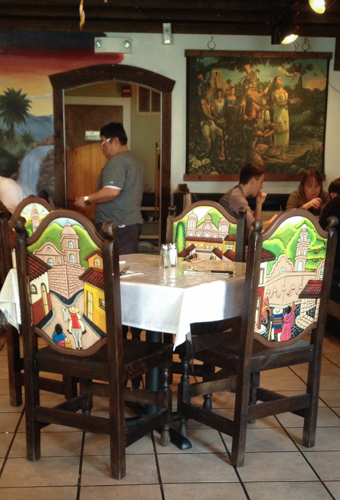 I loved seeing some of the new decorations, including new chairs with Mexican villas carved into the back piece. They were even comfortable to sit in! I ordered 2 tacos off the single taco part of the menu. 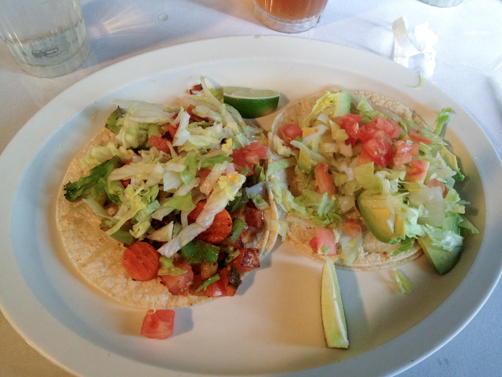 The one on the left is loaded with grilled veggies and lettuce and the one on the right is the aguacate taco or avocado taco topped with lettuce and tomatoes. I—of course—added salsa from our table to my tacos. Yum! The tacos normally come with cheese so just make sure you order them ‘no cheese’ and it will be perfect. These were super filling and I might have even divided them into four tacos as each one comes with two tortillas. Delicious! 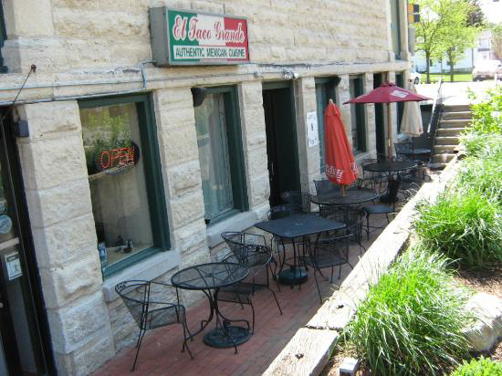 When you’re done, head across the street to O’ Sole Mio for a huge selection of heavenly fruit gelato. How do you order plant-based while out to eat at your favorite Mexican restaurant?